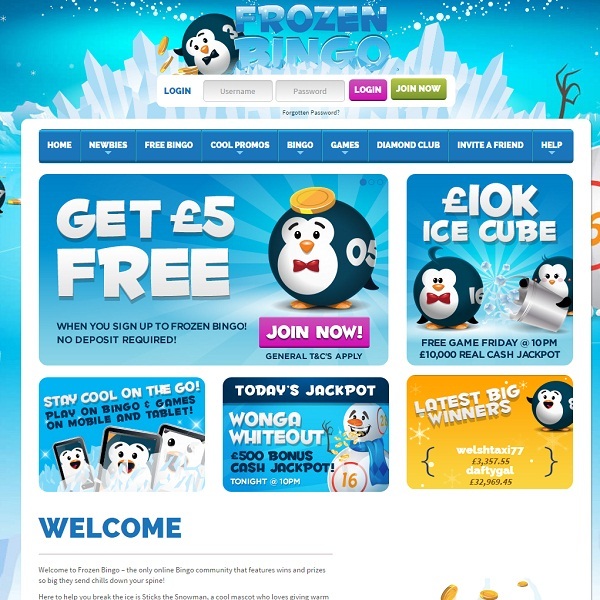 If you like the idea of a world of cute penguins, top quality bingo and side games, generous promotions and more then take a look at the brand new Frozen Bingo. Built upon Dragonfish software, Frozen Bingo is bringing members a great collection of 90 ball, 75 ball and 5 line bingo. The games take place across numerous rooms and include free bingo games, games with guaranteed jackpots, progressive jackpots and VIP games. Members will also find a great selection of slots to enjoy as well as mini games, scratch cards and card and table games. New members at Frozen Bingo are given a warm welcome with a 300% welcome bonus of up to £60. This is followed by a 150% second deposit bonus, a 100% third deposit bonus and a 50% bonus on all subsequent deposits. Members can also benefit from numerous time limited promotions offering fantastic prizes, free bingo games and more.